Creep Catchers operate by filming their encounters with alleged child predators. Nov. 27, 2016 7:00 p.m.
An increase in vigilante-style monitoring of alleged child predators in the Lower Mainland has law professionals worried. Criminal lawyer Robert Mulligan says he is troubled by the uptick in Creep Catcher-related activity. The Creep Catchers Surrey Facebook page has grown to almost 9,000 likes, says they are a group of people who “go online in social media rooms posing as underage children [and] looking for potential predators,” then shaming them online. That, Mulligan says, is a problem. In September, RCMP Const. 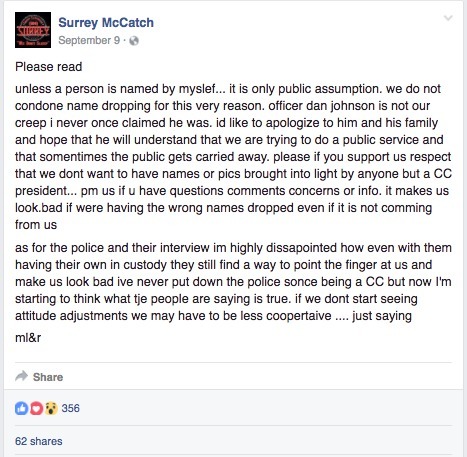 Dan Johnson’s name was dragged through the mud on the Surrey Creep Catchers’ Facebook page, when the man had no connection at all to the case that was being discussed. While Crown Counsel lawyer Steve Fudge notes that only civilians, not police, are government by the entrapment clause, he says that weight given to any submission will vary. “It may not be worth a whole lot. Some of the cases that I’ve read seem more into drawing attention to someone they feel is an offender rather than trying to obtain admissible evidence,” he said, noting that he’s not sure if the catchers bother to follow up with police after posting their videos to social media. The Creep Catchers Canada website states that after the “intervention,” in which the members confront the alleged predators, they submit all evidence to local authorities. A Nov. 21 Facebook post from an account associated with LaForge might also follow Fudge’s thoughts on attention. The post offered to stream a confrontation live online if it got to 100 comments. It appears to have hit that number about a half hour later, as a live confrontation with the alleged child predator was posted. As of Nov. 25, the 16-minute video had more than 16,000 views. In an interview with the Surrey Now earlier this year, LaForge said he wishes that police would collaborate with Creep Catchers in a more active way. “The police don’t even want to talk to me until one of these perverts contacts them and says this guy’s harassing me. And then I get a phone call. I mean, in what kind of crazy world do we live in?” he said. Mulligan worries about the consequences of naming and shaming individuals rather than just submitting evidence to police and leaving it to them. In September, a 27-year-old woman in Edmonton took her own life after a confrontation with Creep Catchers. While reports say Edmonton police have ruled the death non-criminal, an investigation is ongoing. LaForge was asked whether he’s concerned that one of his targets might commit suicide as a result of one of his group’s videos.